Joanne Reitano is a professor of history at LaGuar dia Community College in Long Island City, Queens. She writes wonderful books about the history of the city and state, and has recently been spending many hours -sometimes all day -at her computer. But while sitting in front of the screen, she said, "I developed burning in my eyes that made it very difficult to work." After resting her eyes for a while, the discomfort abates, but it quickly returns when she goes back to the computer.Dr. Reitano has a condition called computer vision syndrome. She is hardly alone. It can affect anyone who spends three or more hours a day in front of computer monitors, and the population at risk is potentially huge. Worldwide, up to 70 million workers are at risk for computer vision syndrome. 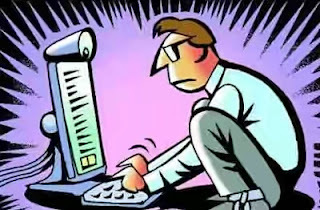 In a report about the condition written by eye care specialists in Nigeria and Botswana and published in Medical Practice and Reviews, the authors detail an expanding list of professionals at risk -accountants, architects, bankers, engineers, flight controllers, graphic artists, journalists, academicians, secretaries and students -all of whom "cannot work without computers." And that's not counting the millions of children and adolescents who spend many hours playing computer games. Studies have indicated 70% to 90% of people who use computers extensively have one or more symptoms of computer vision syndrome.The effects of prolonged computer use are not just visionrelated. Complaints include neurological symptoms like chronic headaches and musculoskeletal problems like neck and back pain. The most common computer-related complaint involves blurred or double vision, burning, itching, dryness and redness of eyes. Another unconscious effect is a greatly reduced frequency of blinking, which results in dry , irritated eyes. Prevention is important, but if you already have these symptoms, ophthalmologists suggest the '20-20-20' rule: Every 20 minutes, take a 20-second break and look at something 20 feet away.